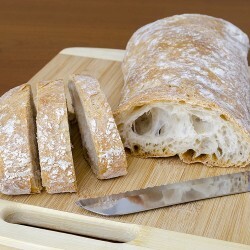 We stock an extensive range of frozen part baked and fully baked breads, rolls, brioche and baguettes. Sourdough and flavoured breads are particularly popular and although the list is large we do have the availability of another 300 different breads!! - delivered to us next day, so if there is something that is not listed, please don't hesitate to ask. Fresh & frozen pastries - shortcrust, Kataifi, feulle de bric and the fresh puff pastry on a 4.2kg roll, one of our best sellers simply pull out as much as you require and chill the remainder. Spring roll pastries, wonton skins, gyozas and blinis are also stocked along with a range of ambient breads such as pumpernickel and volkenbrot. Specialist flours from France, and hard wheat and durum flours from Italy join with our own Cotswold flours and organic flours from Bacheldre watermill in Powys. We also have a huge range of other flours - rice, gram and soya to name but a few along with baking ingredients such as yeast and the ever more popular bread mixes, easy to use ready yeasted - simply add water and bake - with varieties such as ciabatta and gluten free amongst the more usual. BlinisIngredientsWater, wheat flour, non-hydrogenated sunflower oil, lactose, .. Bread Rolls - Hotel SelectionIngredientspoppy seed roll: wheat flour, water, poppy seeds (8%.. Bread Rolls - White BouchonIngredientsWheat flour, water, yeast, salt, wheat malt flour, emu..
Brioche A Tete RollsIngredientsWheat flour, butter(Milk) (20%), eggs, sugar, water, yeast, w.. Sliced Brioche Nanterre Loaf Thaw & Serve IngredientsWheat flour, butter (Milk..
Ciabatta LoafIngredientsWheat Flour, Water, Extra Virgin Olive Oil (1.5%), Salt, Malt F..
Mini Croissants au BeurreFrozen, fully baked mini butter puff pastry croissantsIngredients ..
Demi Baguettes -WhiteIngredientsWheat Flour, Water, Yeast, Salt, Flour Treatment Agent: Asco..
Feuilles De BricIngredientsStrong Flour(Wheat), water, salt, sunflower oil, ascorbic ac..